"Dole is our partner for progress," is the common message of local government officials as they laud on Dolefil's "exceptional" line-up of CSR activities, most especially the Alay Gabay Para sa Maginhawang Buhay Program (Alay Gabay) during this year's series of town-to-town visits (Wheelchairs Turnover Caravan) which kicked-off on June 13 at the Dolefil Gym in Polomolok, South Cotabato. Dolefil's Alay Gabay Program has been giving mobility to persons with disabilities (PWDs) and hope to their families for four (4) years now. From only 305 units and covering only two provinces in 2009, the Alay Gabay Program has become bigger this year, reaching out to over 1,800 PWDs in both the whole of SoCSKSarGen region and Bukidnon - a blessing made possible through the generosity of the Alay Gabay Golf Tournament sponsors and our friends from Westlake Village, Dole Food Company's headquarters in USA. In the Wheelchairs Turnover Caravan from SocSKSarGen to Bukidon, the community expressed gratitude for Dolefil's genuine concern for the community. A mother of two wheelchair recipients in Talakag, Bukidnon (her two sons have polio, 3 y/o & 5 y/o) spoke on behalf of the beneficiaries, stating her overwhelming joy and relief for the gift of mobility for her sons, and that her eldest son can now go to school using the brand-new wheelchair from Dole. In the Gen. Santos City leg of the Caravan, the City Social Welfare and Development Office head Rebecca Magante remarked, "It is good that Dolefil has this Alay Gabay Program. 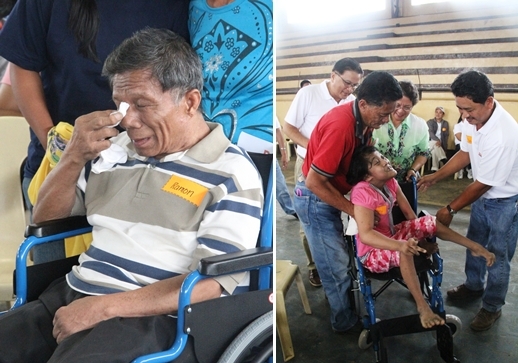 Through this, the PWDs are given chance to live a better life." Out of the 1,800 wheelchairs to be distributed in 2012, a total of 626 wheelchairs have already been given to PWDs in the municipalities of Polomolok, Tupi, Tampakan, T'boli in South Cotabato, Kalamansig in Sultan Kudarat, Maramag and Talakag in Bukidnon and Gen. Santos City. The program is set to visit more towns in July and August, to giveaway more wheelchairs to PWDs and bring joy to their families.